This mantel/surround was made by our customer and friend, Jim M. Jim used KenCraft Company’s Rustic Soft Maple. This mantel would add warmth to any room, with or without the fireplace. You need it for your next woodworking project? The KenCraft Company has it! Contact us to learn more about our huge selection of hardwood lumber. 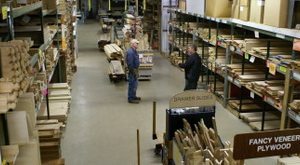 Here at KenCraft, we are a full service mill shop and hardwood lumber distributor. 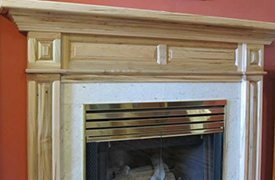 Our shop specializes in custom wood moldings of any quantity. We have in-house knife grinding which allows us to make and match those old and hard-to-find moldings and trim. Our inventory of over 60 species of hardwoods makes it easy to match your unique woodwork. This also allows us to stock hard-to-find moldings such as Hickory, Hard Maple, Cherry, Red Oak, and Poplar. All lumber we stock is personally examined for quality. We also support various milling services such as planning, wide belt sanding, re-sawing, panel making, routing and joining.